The garage ball organizer project is a perfect starter project for anyone. It's simple and requires only basic hand tools. For the more advanced woodworker, it's a great project to get rid of those scrap pieces of wood that you have laying around the shop. These shelves are quite popular with my two best customers: my wife and my daughter. We have them hanging in several rooms of our farmhouse where they hold plates and knickknacks. he DIY to the Rescue crew will help the couple build new shelving and install a corner desk; install a Murphy bed; create new closet storage and add paint and finishing touches. 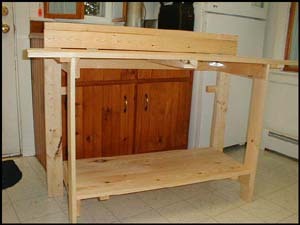 This is a very functional space saving workbench woodworking plan. Free up that valuable space in your garage or workshop with this free woodworking plan. The plan comes with a nice cut list that has all of the dimensions that will need.